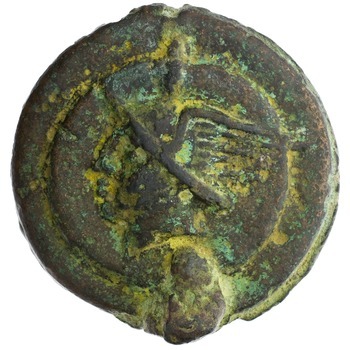 277 out of 410 days: agri quaestorii and Rome’s first issue of cast bronze coins? RRC 14/1. 358.81g. ANS 1969.83.385. Gift of E.R. Miles. In CMRR, Crawford first uses the evidence of the Nemi finds to place the RRC 14 finds ‘no earlier than about 280’. He then goes on: “One may speculate that the need to administer the agri quaestorii acquired in 290 (Lib. Col. 253, 17L; 349, 17 L) played a part in the decision to produce the first issue of cast bronze coinage.” (p.40-41). Even if we go ahead and concede the land around Cures was sold shortly after 290, I have a hard time following the logic of how the sale of land is made easier by the creation of coinage. The words, too, that were uttered by Manius Curius after his triumphs and the addition of an immense extent of territory to the Roman sway, are well known: “The man must be looked upon,” said he, “as a dangerous citizen, for whom seven jugera of land are not enough;” such being the amount of land that had been allotted to the people after the expulsion of the kings. Then at the end of the mini bio in Viris Illustribus (link above) we’re told he’s given 500 iugera by the public for his services (33.10). And, just to add to the mix we should remember that his campaigns in the Po is said to have led to the founding of the colony of Sena which would have also included land distributions (Polybius 2.19). The Periochae of Livy don’t have a land distribution, but do have the colonial foundation. Cato the Elder, and Cicero after him, loved Dentatus as the epitome of the rustic Roman, military man and farmer, happy to conquer everyone in sight and still eat a simple stew from a wooden bowl. [Cincinnatus, anyone!?] The literary sources care FAR more about the bon mot than the distribution. I don’t think we can nail down a context for it. Thus, I think this is just a fun rabbit hole with very little promise for finding a context for the aes grave. 6. in the four hundred and eighty-first year from the founding of the City, Manius Curius Dentatus, who held the censorship with Lucius Papirius Cursor, contracted to have the waters of what is now called Old Anio brought into the City, with the proceeds of the booty captured from Pyrrhus. This was in the second consulship of Spurius Carvilius and Lucius Papirius. Then two years later the question of completing the aqueduct was discussed in the Senate on the motion of the praetor. At the close of the discussion, Curius, who had let the original contract, and Fulvius Flaccus were appointed by decree of the Senate as a board of two to bring in the water. Within five days of the time he had been appointed, one of the two commissioners, Curius, died; thus the credit of achieving the work rested with Flaccus. The intake of Old Anio is above Tibur at the twentieth milestone outside the* Gate, where it gives a part of its water to supply the Tiburtines. Owing to the exigence of elevation, its conduit has a length of •43,000 paces. Of this, the channel runs underground for •42,779 paces, while there are above ground. substructures for •221 paces. I’d not like to connect this aqueduct to any one issue but like the construction of Via Appia, big infrastructure projects and the establishment of colonies are easier if the state has an easy means of making payments. Previous Post 269 out of 410 days: Do you believe the pig story? Another Q and oath-s… on EETIA?